Sauté celery, carrot, and onion with a pinch of kosher salt until onions are softened. Add zucchini and green beans, sauté 5 minutes. Add minced garlic and stir to disperse. Meanwhile, bring broth to a boil and add 2 fresh thyme sprigs and one bay leaf. Cook pasta according to package directions in the broth (instead of boiling water). When pasta is ready, remove thyme sprigs and bay leaf and add vegetables and farro to broth. Season to taste with pepper and salt, and serve. 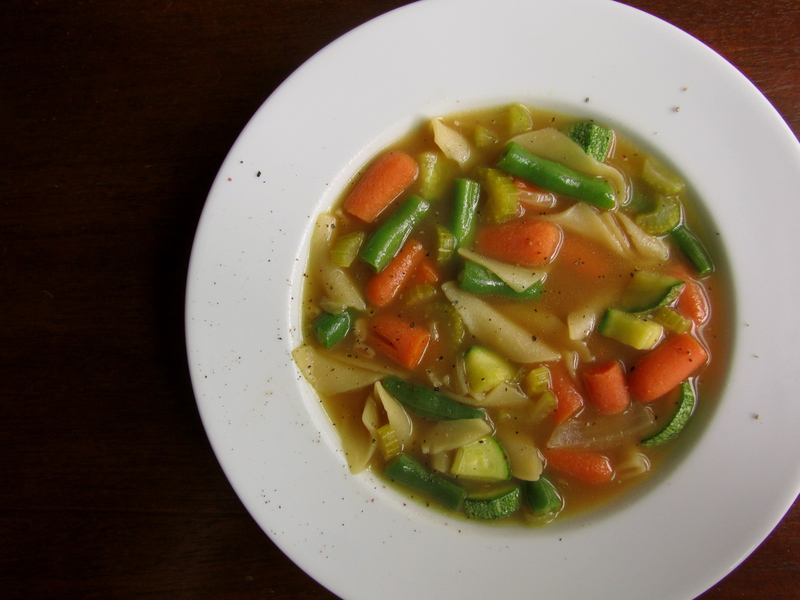 This entry was posted in soup, Sweet Life Laur Original, vegetables, vegetarian and tagged chicken noodle soup, cold, vegetable noodle soup by Laura Zolnoski. Bookmark the permalink.